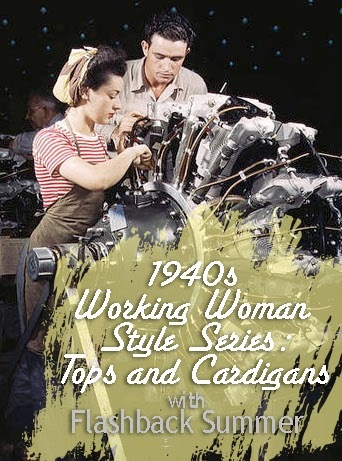 One of the most remarkable things about 1940s working women is that they not only wore clothes that helped them work effectively, but they oftentimes made those outfits pretty. 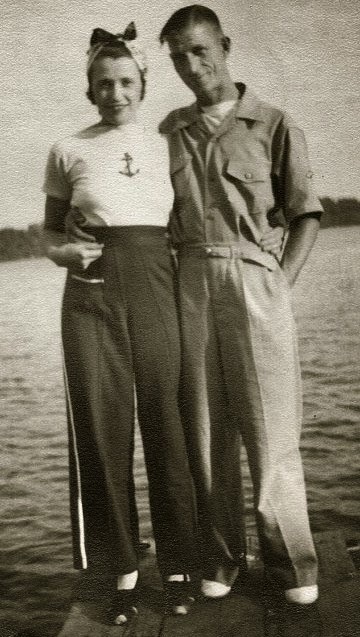 They, as much as possible, retained a feminine appearance and personalized their outfits as they could. 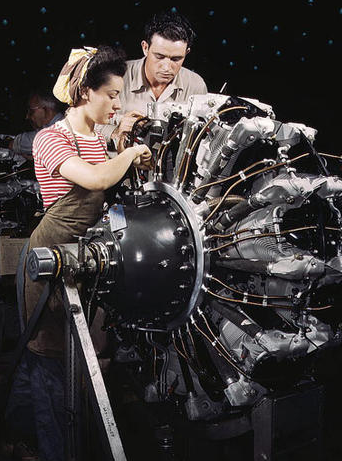 Sure, they might be putting planes together in a loud, dusty factory, but dangit, they were gonna look good doing it! 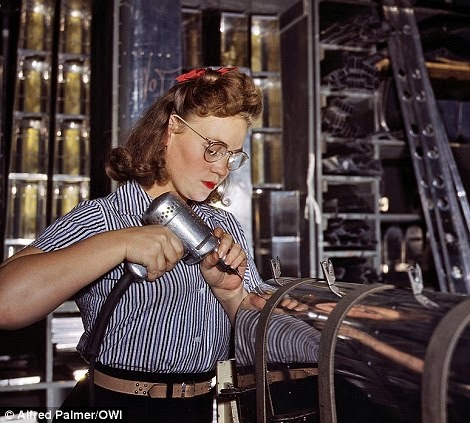 Yes, safety regulations required that hair be up and out of the way, but did that depress 1940s working women? No way! 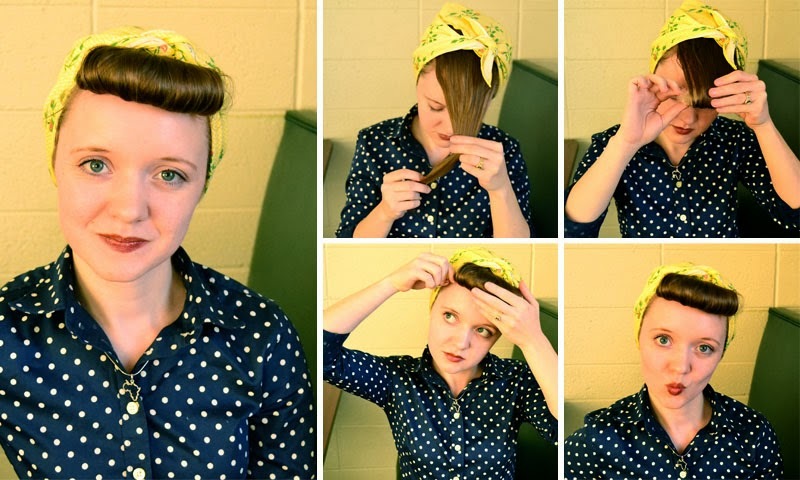 It's just a chance to do awesome updos and bandana styles! 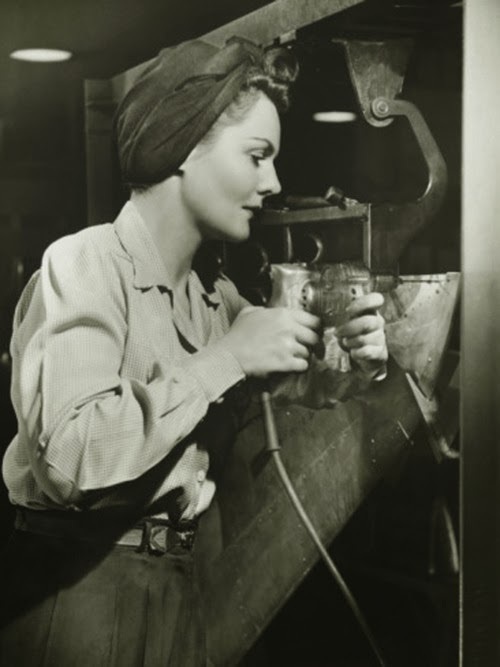 As I've talked about in a previous post in this series, head scarves/bandanas were an integral part of a working woman's wardrobe largely for safety concerns, but that doesn't mean they didn't become fashion statements as well! Isn't this polka dotted scarf just adorable?! 3. Natural Makeup and Hot Lipstick. 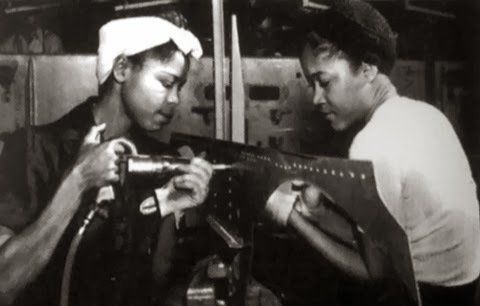 I would imagine these ladies' morning routines were fairly simple and quick, but their makeup was natural and emphasized their natural beauty as women. 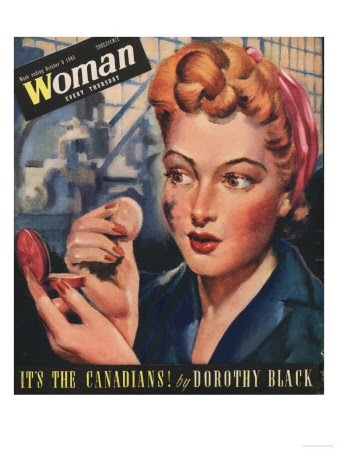 And, of course it was impossible to forego the bright lipstick! Nothing adds class like a sassy lipstick. 4. Earrings and small jewelry. 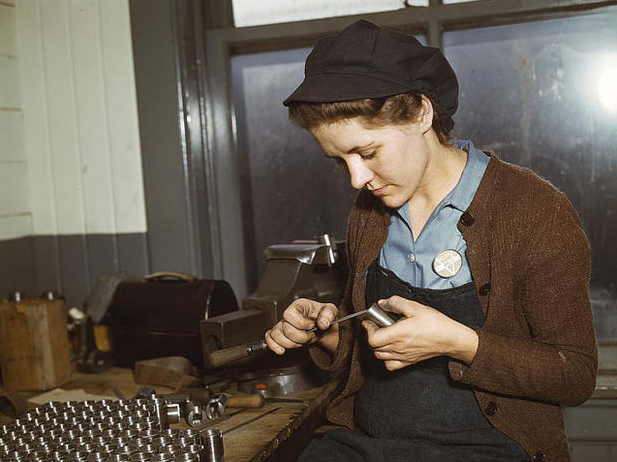 Obviously, safety requirements forbade jewelry like necklaces and long baubles because of the risk of getting caught in machines or other accidents, but that doesn't mean that other jewelry was used. Stud/clip on earrings could be worn, along with pins (oftentimes as work IDs or tokens from a loved one overseas), brooches, and hair ribbons, as can be seen in some of the photos below. Even such small touches, I think, add a lot to these ladies' looks. It makes them seem put-together and intentional instead of just putting on a work uniform they have to wear. 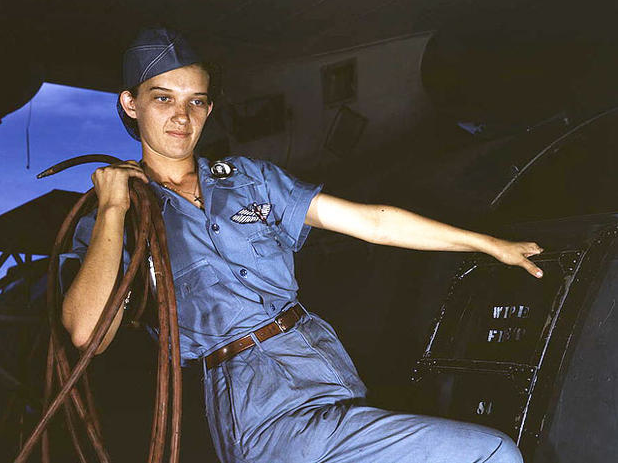 They took tiring, difficult, and oftentimes dirty, tough situations and brought beauty to them. 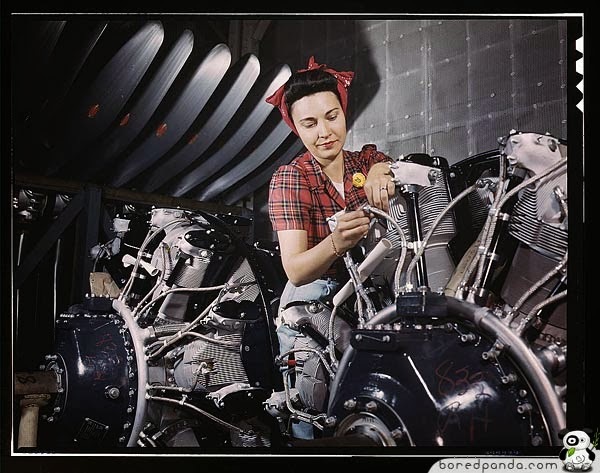 Below I've included some more photos of 1940s working ladies to inspire you as we wrap up this series. To find all the rest of the posts on this subject, you can find the intro page here. I hope you've enjoyed this look at practical 1940s working woman fashion! 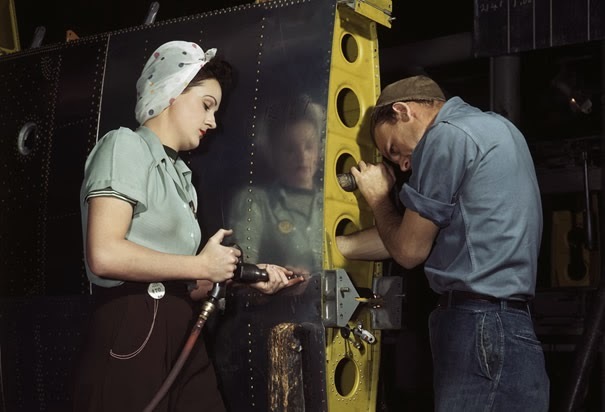 The blouses and top layers of working women in the 1940s had to be hardy, comfortable, safe, and-- preferably-- fashionable. 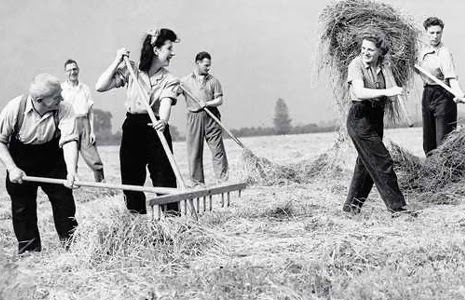 Sometimes work in factories or outside on farms would be hot, messy work in which t-shirts or short sleeved blouses would be the norm. 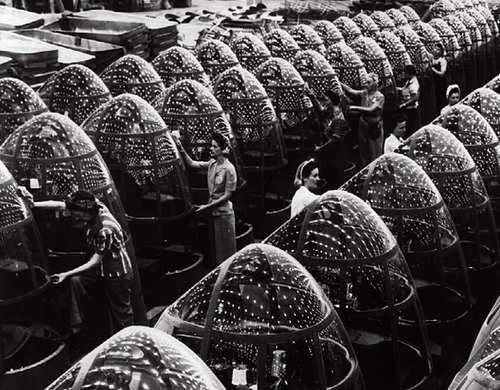 Other times, women were working in cold weather, or they had to protect their skin from metal bits or wood dust. 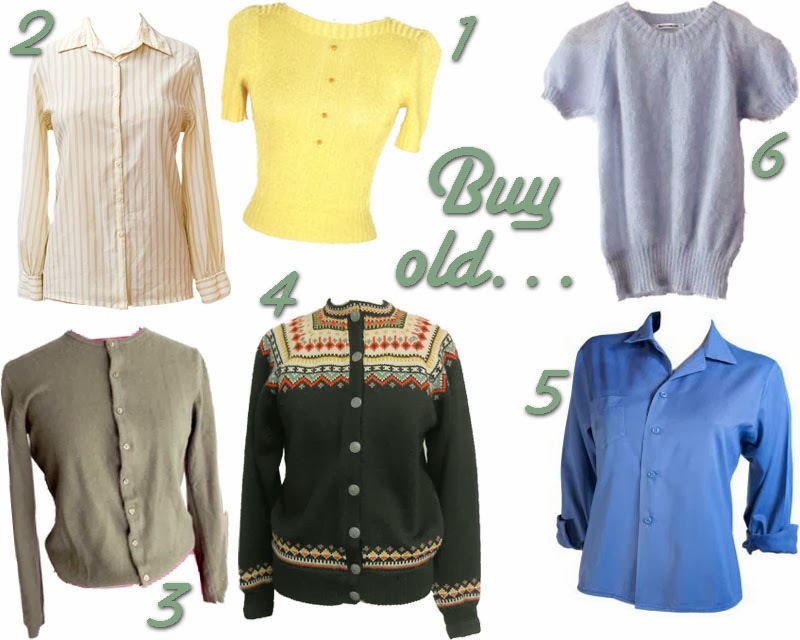 In these cases, long sleeved shirts and sweaters or cardigans would be used. According to the photos I've seen, this seems to be the most common kind of top. 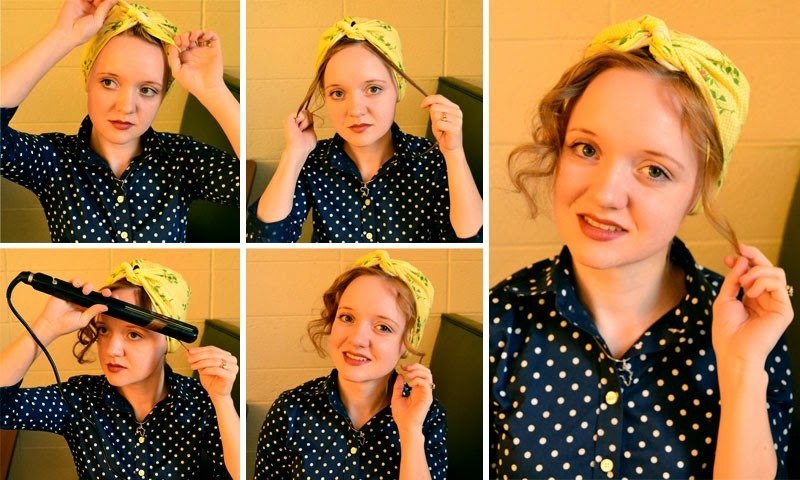 The 1940s headscarf/bandana has been one of the best discoveries I have ever made in life. 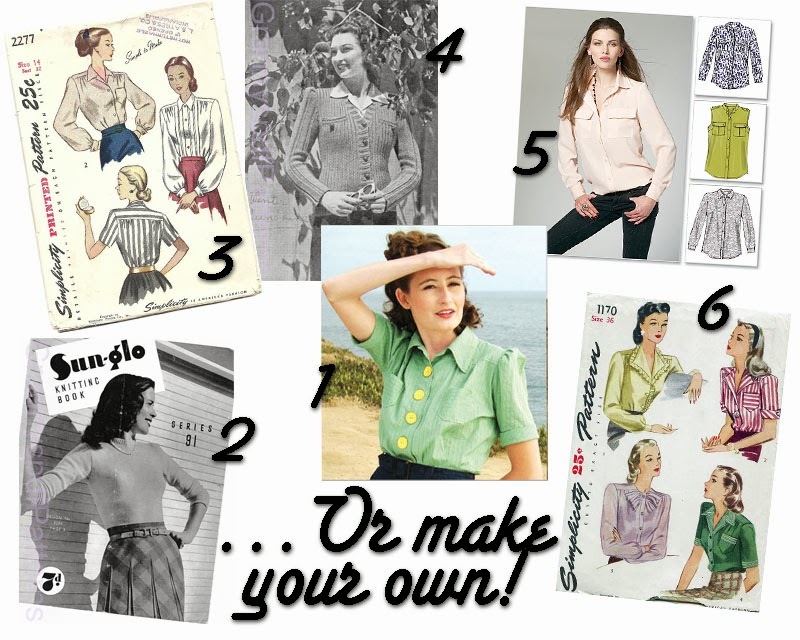 At least, when it comes to vintage fashion. Bandana styles are quick, practical, stupendous for windy/wet days, offer another way to accessorize, and are quite recognizably "vintage". They cover pin curls, horrible hair days, thinning or graying hair, and I cherish the styles for my woke-up-10-minutes-before-leaving days. 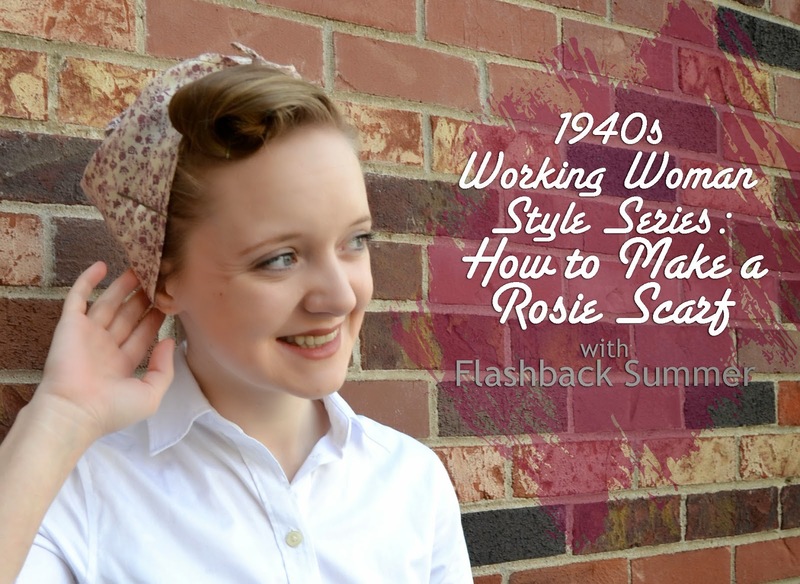 So today I have several tutorials and style inspirations for simple, easy 1940s bandana hair. I've also included links to other tutorials on other blogs you may find helpful! 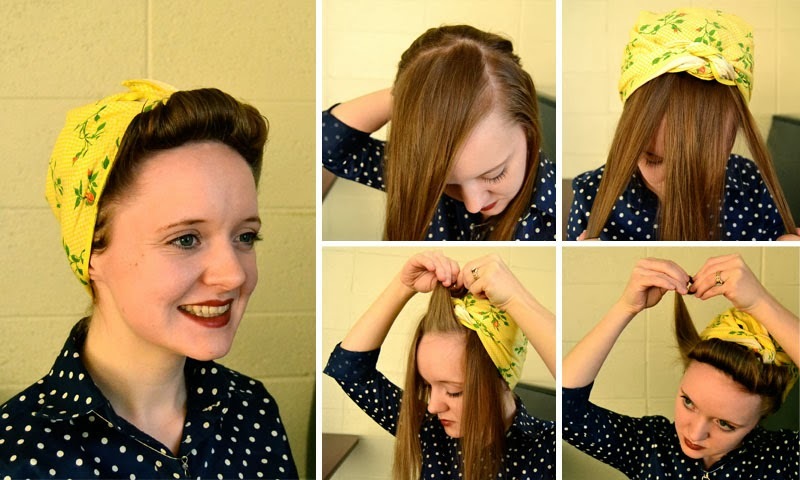 As the base for the hair tutorials I am sharing with you guys below, I'm using a typical, easy 1940s bandana-tying base using a square bandana. There are a lot of tutorials on how to do this, so I'm not going to reinvent the wheel; I'll just give you this link to instructions. 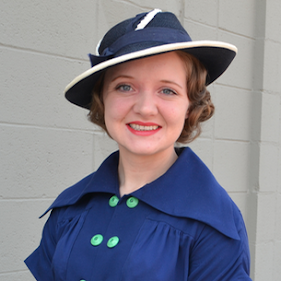 Many of the styles work best with hair that has been pin curled, too, although curling on the spot works as well. This tutorial is the easiest. Simply take a section from the front, twist it, push it up toward the hairline a bit to make it pouf, and pin it down with bobby pins in an "X". 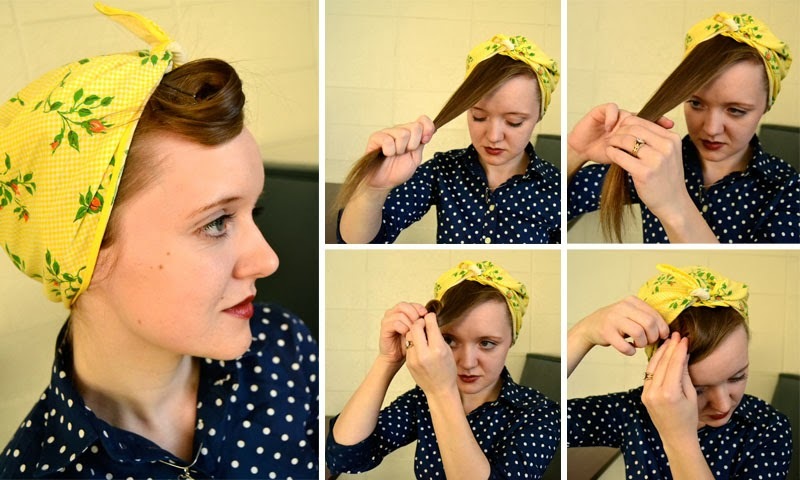 Put the rest of your hair into the scarf (by twisting it or even pin curling it for later) and tie. Secure with bobby pins on the side for extra hold. See the 'do fully styled here. 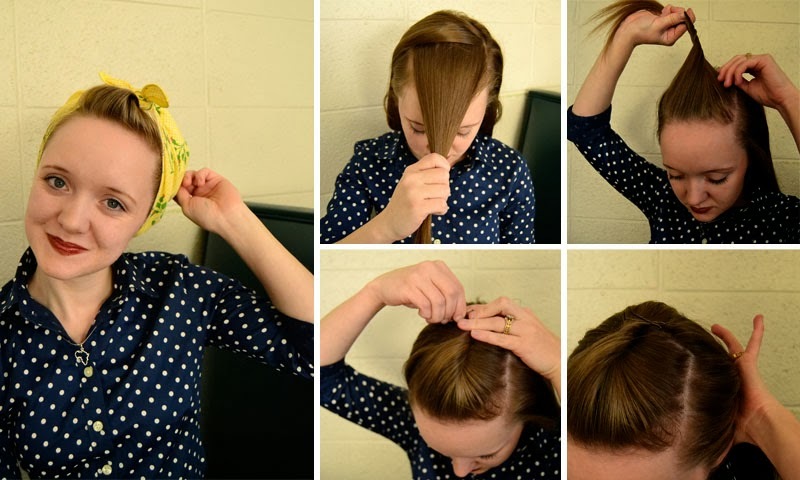 This is the same as the twist-and-pin style, except instead of twisting the front portion first, you will put on your scarf, then take the front portion of hair and roll it into a single victory roll that is pinned perpendicular to the hairline. Hairspray! 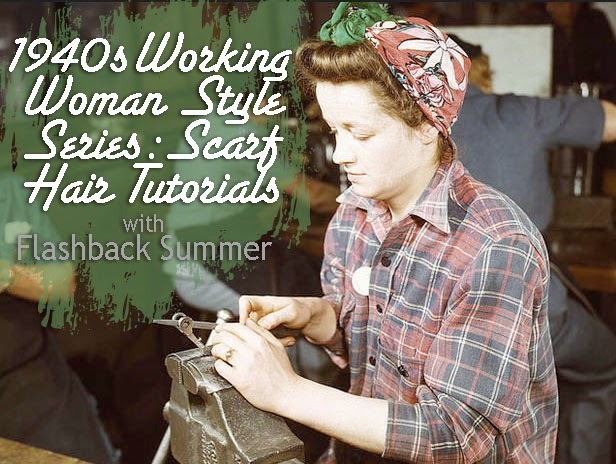 Still keeping the same basic instructions as the last two styles, you will now put your scarf on, comb the front portion of hair forward, and roll it backwards in a pin curl toward the hairline. 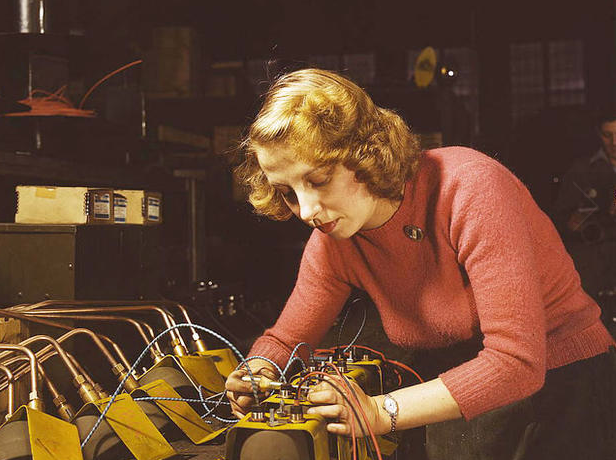 (The pin curl will be horizontal.) Pin at the base and hairspray. See this 'do fully styled here. - You can separate a large portion of hair from the front, ear to ear. I like to put my scarf on at this point to make sure I position the rolls correctly. Now divide the front hair into three sections, make a vertical victory roll out of each section, rolling it away from the mirror. (I used a hair rat in the middle because my hair isn't very thick.) Each roll will line up with the others, creating the look of one large roll. Hairspray. You could also use a curling iron for a roll like this. - Or, you can divide the hair into a front and back section, put a long hair rat behind the front section, lay your hair over it and pin down behind the hair rat, covering the sides of the rat with the hair. Then you can tie your scarf on over the ends of your hair. 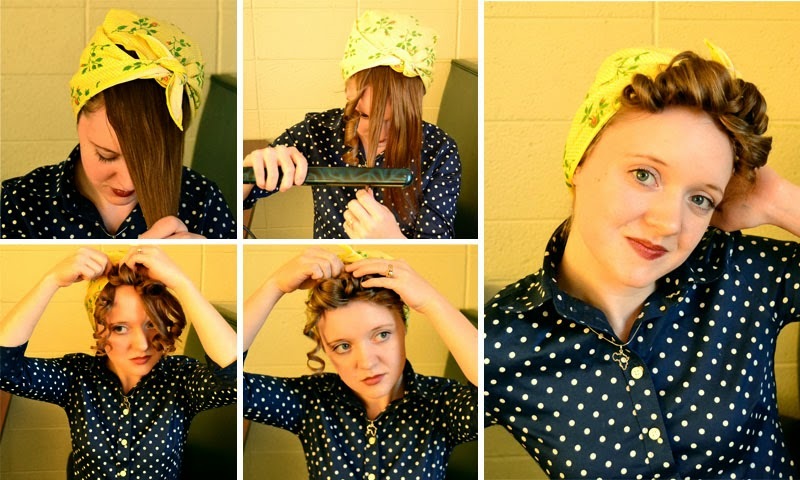 Divide a large section from the top and front of your hair, then put the rest of your hair into a scarf and tie it on. Roll your hair down and toward your hairline and pin at the base. A hair rat could also be used to make the roll a little easier and neater. Hairspray. Short hair: For shorter hair, pull out a section from the top and front of your hair as in the tutorial above. Put the rest of your hair in a scarf and tie it up. Tightly curl the hair in small chunks, then brush it out to give it some poufiness. Hairspray! Long hair: Separate a chunk of hair from the front as before. Twist the rest of your hair from the nape of your neck and pin it up along the line a mohawk would be on. Leave the ends free. Tie your scarf on over the twist with the ends and the front section left out. Curl all these ends tightly, then pin the curls down to create lots of rolls. Hairspray. This one is quite simple. Tie your scarf on, and pull out some hair from the front. If your hair is pin curled already, then leave it. If not, curl the hairs now and brush them out a bit if necessary. Hello again! I hit a couple road blocks this weekend with getting posts up according to the original posted series schedule, but I'll get it back on track in the next couple days, I promise! 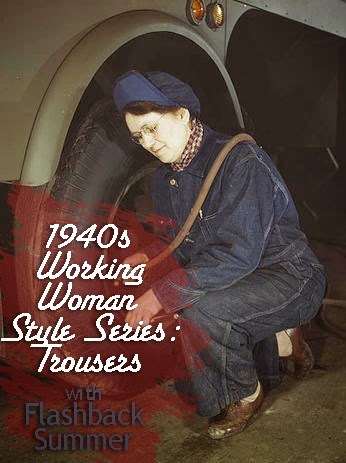 Today we're talking trousers, 1940s working woman trousers. 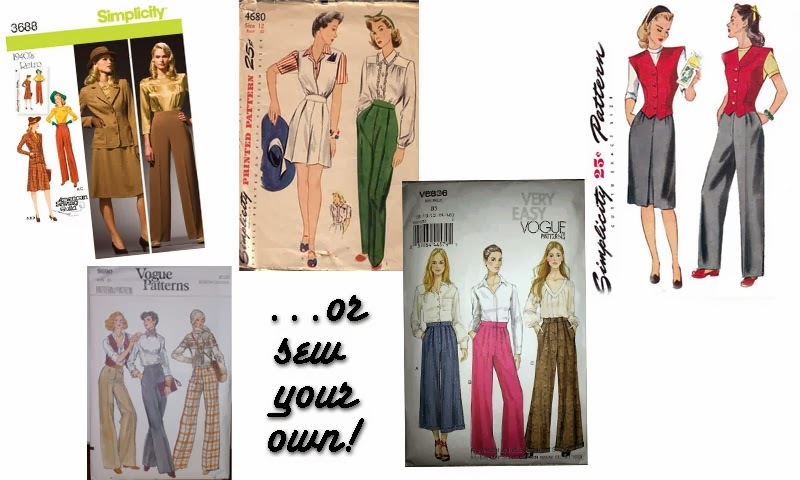 I've got some 1940s trend-talk, inspiration, extra info links, and ways you can get your own 1940s trousers! 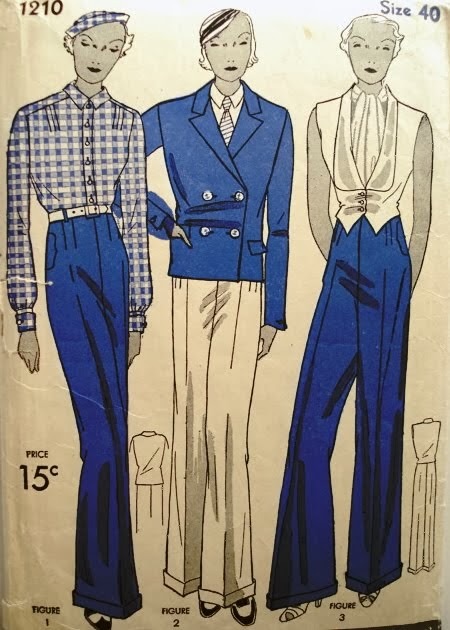 So first of all, what exactly were the trouser trends of working women in those days? 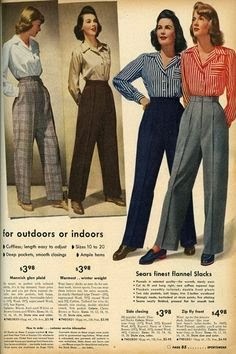 How did they fit, and fabrics and colors were common? 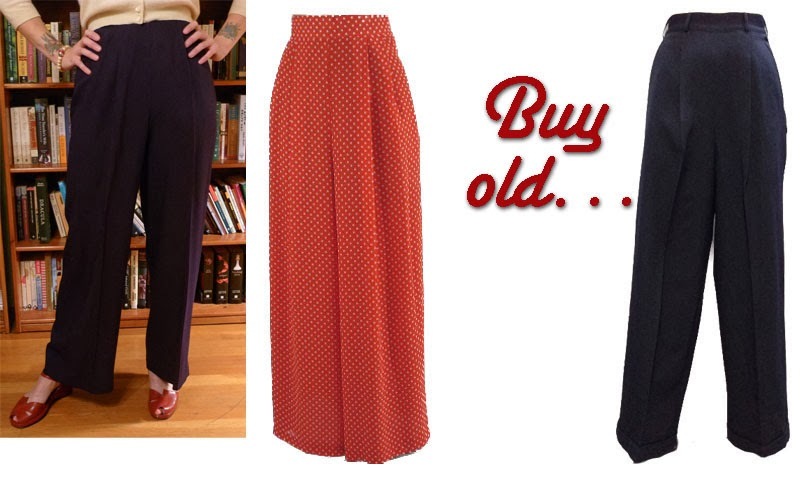 Notice the high waist, wide leg, and front pleat/ ironed detail that both pairs share in common. 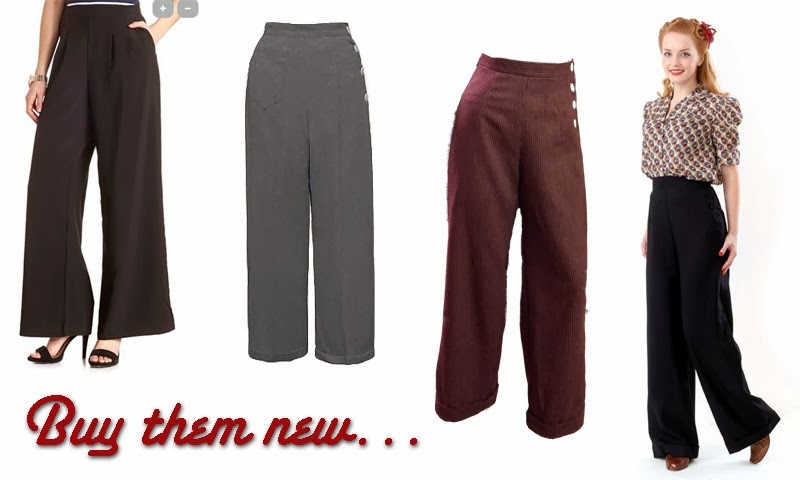 This style is really the only prominent style of trouser, especially of the trousers worn by working women. 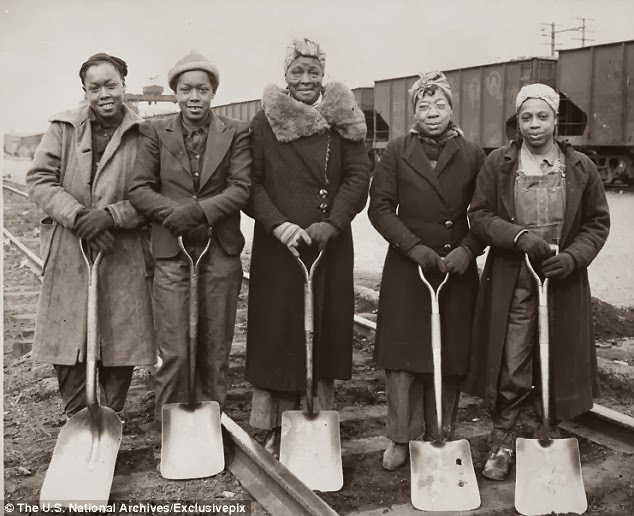 The bagginess worked quite well for the bending, moving, and tough work women were doing, too! 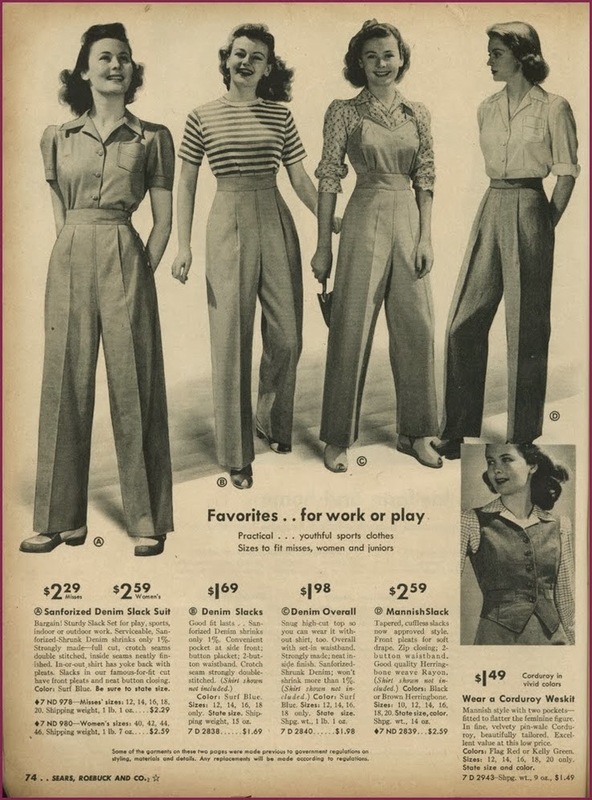 Generally speaking, although there are exceptions, 1940s women's pants also had side or back zippers, not front flys. The ad below does include a front fly option on the right, however! 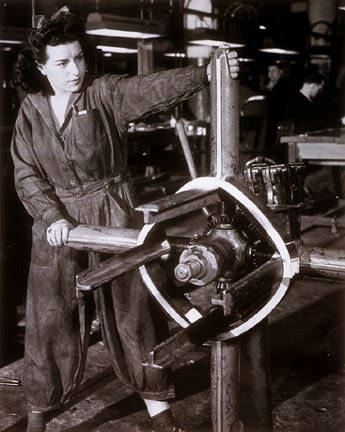 So now for the big question...... Where can you get your own 1940s working woman trousers? I've got lots of options for you! 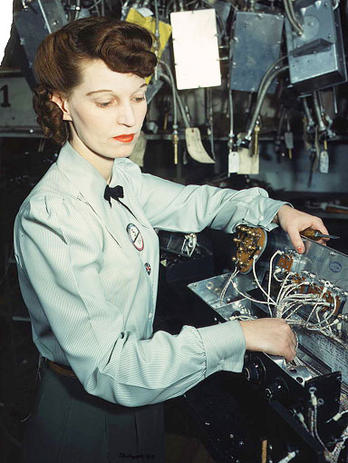 The headscarf/bandana was an integral part of a 1940s working woman's wardrobe. 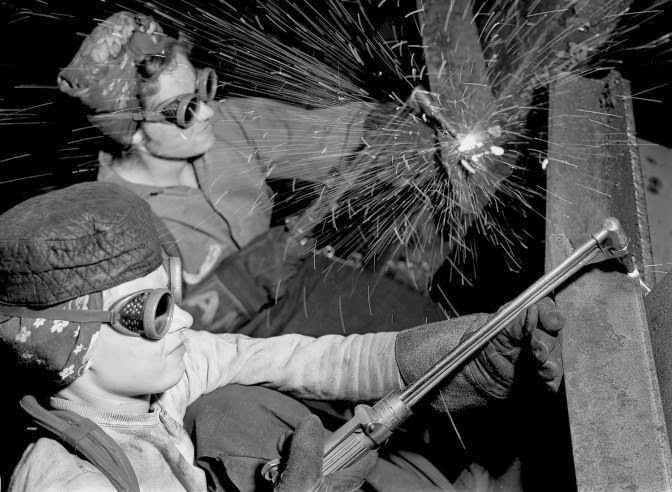 Headscarves provided workplace safety, comfort, practicality, and style. 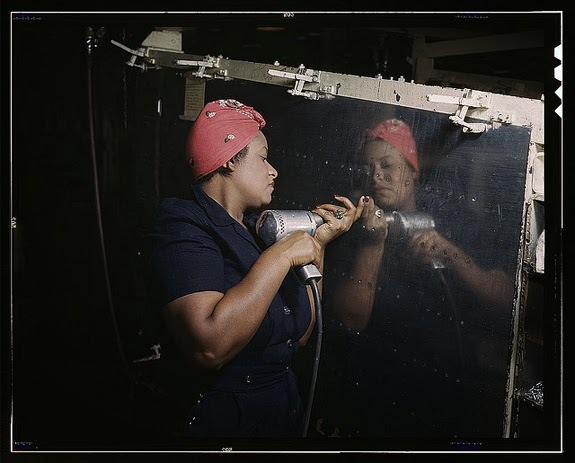 They helped keep women's hair out of dangerous machinery, out of the way on hot days, conveniently covering pin curls for that evening, or a quick thing to throw on and still look presentable. They're amazing! 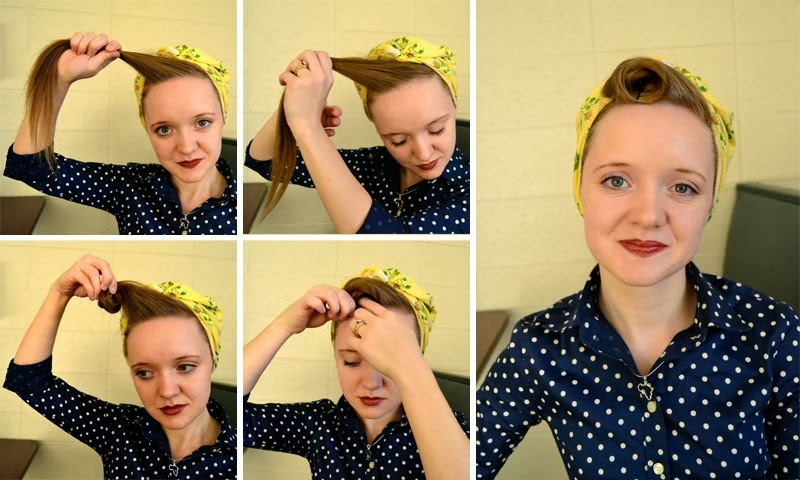 I personally utilize 40s headscarf styles all the time, and I have one vintage bandana I found in a flea market that I especially love because it's larger than bandanas that can be found at craft stores these days and, therefore, stays on much better. Then it dawned on me..... It's just a hemmed triangle of cotton! What's to stop me from making my own?! And why not share with my friends who could also benefit?! The tutorial is great because it's so simple. 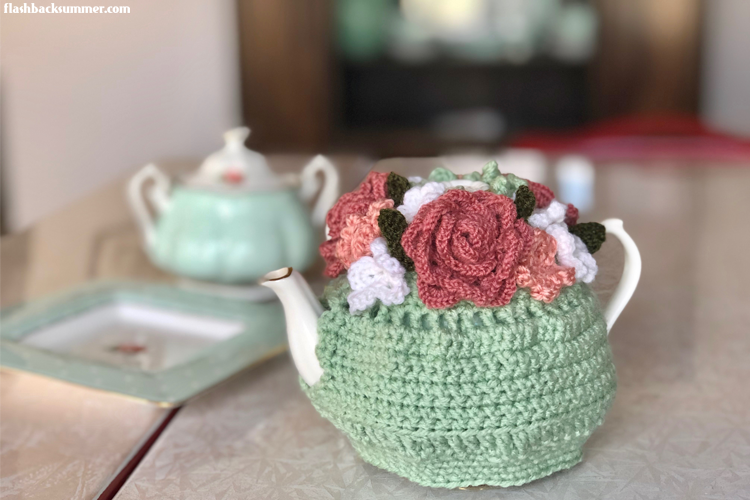 Especially if you don't sew a lot or only hand sew, this is still a project that you could do! 2. While looking at the wrong side of the fabric, fold the edges of the triangle in about 1/4" (for a narrow rolled hem) and press. Trim and fold the corners as necessary to make it look neat. 3. Now fold the fabric in again. The raw edges will be tucked into this next fold, so all edges should look clean. Again, trim and fold the corners as necessary to make it look neat. 4. Sew the edges of this rolled hem down all around the edge of the triangle. 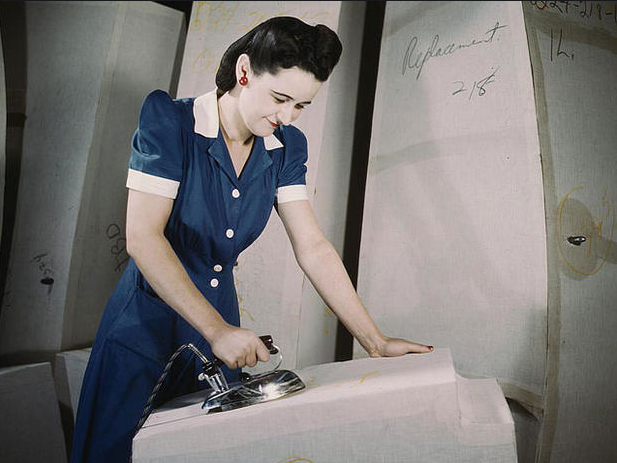 Iron it again for good measure! 5. Try on your new bandana! Optional Bias Tape Variation: Instead of doing a rolled hem, fold thin bias tape in half and sew around the edge. It would look super cute, especially in a contrasting color! 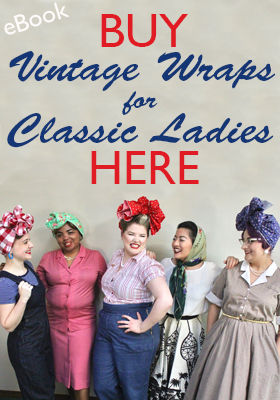 And I also have a few other resources for you on how to make other styles of 40s head coverings! Options are a great thing to have!